SMS Blocks - The SMS Templates Tool app: insight & download. Compatibility: Requires iOS 10.3 & up. Stay in touch with your friends and associates! With SMS Blocks you can create your own message templates and use them again and again for recurrent events. Equip your message templates with placeholders and add the appropriate values just before you send your SMS message. Create categories to organize your SMS templates and access them faster. Need to inform a caller quietly that you cannot answer the phone while you're in a meeting? With just three taps you can send a message to inform him or her that you'll call back in 20 minutes. SMS Blocks can then automatically create a calendar event for you. So you can be sure that your IPhone reminds you to return the call. Do you want to tell your friends what music you are currently listening to? Its so easy: With two taps your prepared message is ready to be sent. Have to reschedule the regular tennis match again? No problem, just fill in the date for the next match just before the message gets out. + Placeholders: SMS Blocks offers 20 placeholders which you can use in your SMS templates. 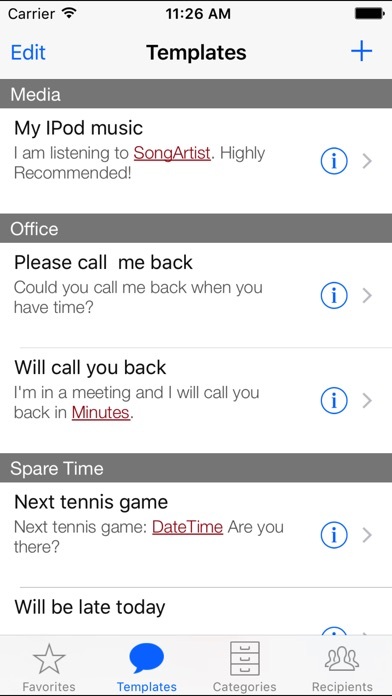 With placeholders you can fill in appropriate data just before you send the SMS. SMS Blocks provides placeholders for date/time, location, media and number values. + Custom Placeholders: Now you can define your own placeholders! Before you send your SMS you can just select the actual value for a custom placeholder. + Categories: Organize your templates in categories. + Address Book Integration: Import contacts and create recipient groups. Define default recipients for SMS templates and even for categories: Every SMS template, which does not have a default recipient or recipient group, will inherit the recipient of its category. Or just start by selecting the recipient or group and then select the SMS template you want to send. + Calendar Integration: If a SMS template contains a date or time placeholder, you can enable SMS Blocks to create an event in your standard calendar. Never again miss a date you have announced by SMS! + Location Awareness: Send your friends the address of the place you are! 7 new placeholders are now available for this cool feature. + SMS and iMessages send out: In our app we use the proven messages engine from Apple that you also use when you create SMS or iMessage messages on your iPhone directly. If you have any problems with our app, please do not hesitate to contact our support team (support@in-4-matics.de). We are pleased to help you. iPhone is required to actually send SMS messages.